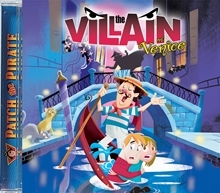 There’s music, mystery, and mayhem in Venice. The scent of garlic is in the air as gondolas are sinking everywhere! Come along with Captain Patch and his crew as they solve the mystery with Papa and Mama Carrabba and Sherlock! It’s an Italian musical feast for your ears. You’ll be rolling in Mama’s special “schpaghetti” sauce.